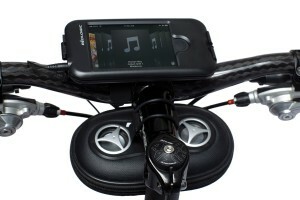 Personal speaker system for your bike, allows you to air your favorite tunes while cruising the strip. Hook it up to your iPhone, iPod or MP3 player and you have instant music during your ride. PowerBoost bass technology delivers excellent sound through the stereo speaker system. CycleTunes attaches quickly to a stem, top tube or handlepost and is compatible with the BioLogic Bike Mount for iPhone.